Drinking tea makes sushi taste better! Even if you order beer or sake at sushi restaurants, your meal will always end with a cup of tea. But if you’re going to go out for sushi, you should really start drinking that tea earlier instead of saving it until the end. The tea at sushi shops is far more significant than a simple beverage. Especially when eating fatty tuna or bonito, tea plays a role that beer and sake simply cannot fulfill. The key is in its hot temperature. Hot tea works to dissolve the fat left on the tongue. Traces of fat is left on your tongue when you eat fatty sushi. It covers the taste buds like a film, subtly inhibiting your sense of taste. It would be a shame to miss your chance to experience the full range of flavors on your visit to a delicious sushi restaurant. No matter how much you drink, beer and sake can’t do anything about this thin film. But drinking hot tea dissolves the fat and washes it away. Tea can also be considered a type of preparation for enjoying the next piece of sushi. Another fun fact, sushi teacups are bigger than traditional tea cups because sushi chefs used to man their food stands alone. They just didn’t have enough hands to be constantly refilling tea while also pressing the sushi. The stands used large teacups so they wouldn’t need to be refilled as often. Posted on June 12, 2017 September 12, 2018 Categories Basic KnowledgeTags Green tea, How to, Nigiri sushi, Sushi etiquette, Sushi roll, Table MannersLeave a comment on Drinking tea makes sushi taste better! How do you order at a sushi restaurant? 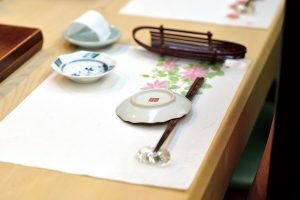 The sushi restaurant is unusual in that the customer sitting at the counter can see the seafood (neta) from which individual servings will be made, and can watch the chef deftly perform his art while enjoying lively conversation. Sushi restaurants also differ from other restaurants when it comes to menus. If the customer is inclined to worry about what the bill will come to, he orders Okimari (combination set)*. 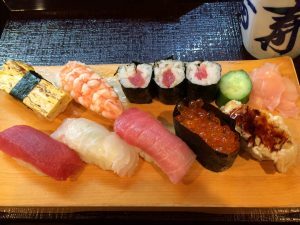 This consists of 7 to 10 pieces of nigiri-sushi and nori-maki selected by the proprietor in such a way as to allow them to offer an affordable price. It is cheaper because, like ready-made clothes, Okimari is not necessarily made piece by piece to fill individual orders. Of course, it will not be of inferior quality. Okimari is prepared by the chef and his assistants in the same way that everything else the shop is prepared. If the diner still wants more, they are always free to order sushi of their choice (Okonomi). Generally Japanese customers eat no more than 10 pieces of nigiri-sushi. People at the counter most often order Okonomi (a la carte)**, which may be likened to having suits tailor-made from the finest fabrics. The customer who orders only the best will find that the check at the end can get a little expensive. But this is worth remembering (sushi worth eating is never inexpensive). Long ago people used to say that first ordering Okimari and then ordering Okonomi after was the best deal for eating sushi, but that is a thing of the past. Actually, there are more and more shops that don’t allow Okonomi orders. The only choice is Omakase***. In some cases, all customers sitting at the counter take their seats at the same time and eat the same dishes and the same sushi in the same order. Even if you know nothing about sushi toppings, if you leave it to a master sushi chef, they will provide you with a combination boasting a good balance of early, peak and late season sushi. Omakase is great as it allows you to concentrate on genuinely enjoying the sushi and, especially if you’re visiting a shop for the first time, there will be no confusion regarding the best dishes. *Okimari－The price and menu content are easily understood when ordering “Okimari”. The rank of “Tokujou”, “Jou”, “Nami” are often used. Order additional sushi as you like for a more fulfilling experience. **Okonomi－A way customers choose and order sushi they want to eat. If you clearly know what you like and want to enjoy eating at your own pace, ordering “Okonomi” your choice of sushi, would be best. 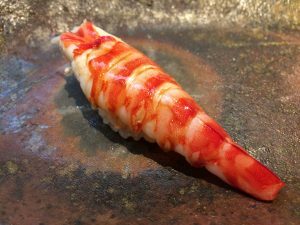 ***Omakase－If you don’t have any preferences, and you are happy to have a professional choose the most delicious toppings from that day’s catch, then ask for Omakase. 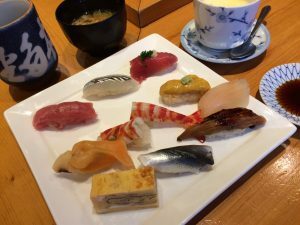 Posted on May 22, 2017 December 3, 2018 Categories Basic KnowledgeTags How to, Nigiri sushi, Okimari, Okonomi, Omakase, Sushi Glossary, Table Manners, The A to Z, Washoku6 Comments on How do you order at a sushi restaurant?